A Garden City University College instructor teaches microscopy to students in Kumasi, Ghana. 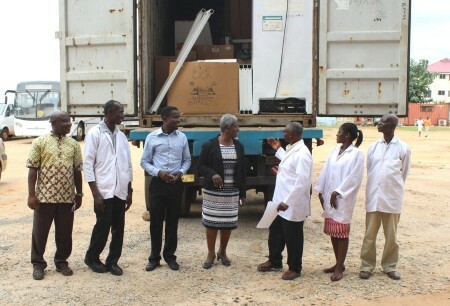 Across Ghana’s health sector there are critical shortages — from nurses and midwives to radiologists and medical laboratory technologists. Participation is affordable but not free — participants like GCUC pay a share of the cost based on their country’s income level as defined by the World Bank. This helps defray some of the costs of procuring, storing, handling and shipping equipment as well as administering the program. Seeding Labs is the only U.S. organization to provide this kind of service. The Seeding Labs shipment arrived at GCUC in August 2016 and included contributions from 31 U.S.-based corporations, universities and research institutes including Merck; Takeda Pharmaceuticals, through their Access to Medicines initiative; and Thermo Fisher Scientific. It contained nearly 3 tons of equipment — a PCR (polymerase chain reaction) machine, incubators, safety hoods, spectrometers, microscopes, a liquid separation system, laboratory refrigerators and freezers, and a biosafety cabinet. About the Author: Karen Fowle serves as a Monitoring and Evaluation Specialist in USAID’s U.S. Global Development Lab. Editors Note: This story was originally published in the May/June issue of FrontLines, USAID’s bimonthly online magazine. Karen Fowle serves as a Monitoring and Evaluation Specialist in USAID’s U.S. Global Development Lab.